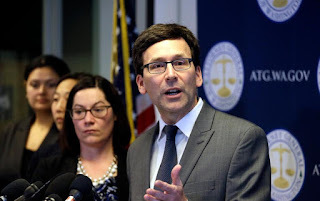 Washington State Attorney General Bob Ferguson speaks at a news conference about the state's response to President Trump's revised travel ban in Seattle, Wash. Ferguson has asked a federal judge for a Tuesday, March 14, 2017, hearing on the case. SEATTLE (AP) — More than a half-dozen states trying to block President Donald Trump's revised travel ban moved forward Monday with a pair of lawsuits while the government asked that the order be allowed to take effect this week. 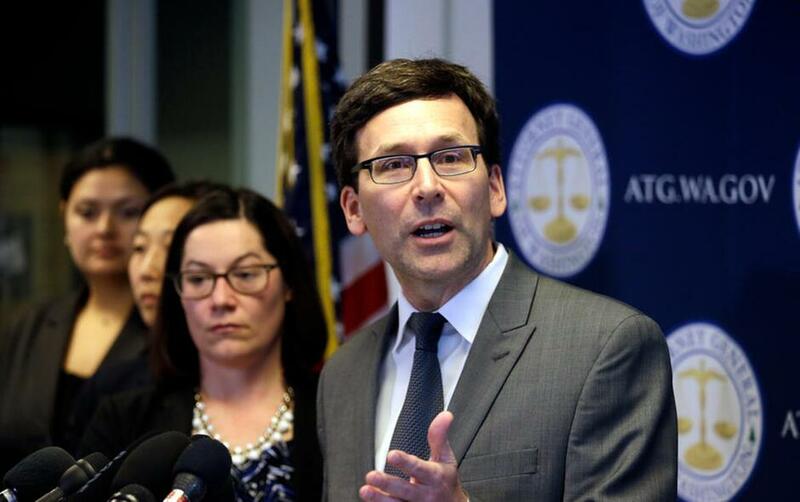 Washington state Attorney General Bob Ferguson, joined in his lawsuit by heavily Democratic California, Maryland, Massachusetts, New York and Oregon, asked for a hearing with a federal judge in Seattle before the administration plans to implement the ban Thursday on new visas for people from six predominantly Muslim nations. A hearing in a separate lawsuit by Hawaii already has been scheduled for Wednesday. Ferguson said the revised ban is still unconstitutional and harms residents, universities and businesses, especially tech companies such as Washington state-based Microsoft and Amazon who rely on foreign workers. "No one is above the law, not even the president — and I will hold him accountable to the Constitution," Ferguson said in a statement. "Cutting some illegal aspects of President Trump's original travel ban does not cure his affront to our Constitution." Ferguson filed new court documents after the judge who put Trump's original order on hold said last week he would not immediately rule on whether his decision applies to the new version. U.S. District Judge James Robart told the federal government to quickly respond to Ferguson's claims but said he would not hold a hearing before Wednesday. California Attorney General Xavier Becerra announced the most populous U.S. state was joining Washington state's challenge, saying the order, despite its changes, is an attack on people based on their religion or national origin. In Hawaii, which is alone in its lawsuit, the U.S. government asked a federal court Monday to deny the state's request to temporarily block the ban from going into effect. A judge will hear arguments Wednesday, with the heavily Democratic state claiming the new order will harm its Muslim population, tourism and foreign students. Ismail Elshikh, a plaintiff in Hawaii's challenge, said the ban will prevent his Syrian mother-in-law from visiting. The government says Hawaii's allegations that the ban will negatively affect tourism and universities are pure speculation. It also says neither Elshikh nor his mother-in-law have been harmed because she has not been denied a waiver for a visa to visit the United States. Trump's revised ban applies to Somalia, Iran, Syria, Sudan, Libya and Yemen and temporarily shuts down the U.S. refugee program. Unlike the original order, it says people with visas won't be affected and removes language that would give priority to religious minorities. Ferguson acknowledged the changes to the order but said it still "bars entry for virtually all other individuals from the listed countries," including relatives of U.S. citizens and students who have been admitted to state universities and people who might seek work at schools and businesses. "This court's original injunction protected these individuals and institutions," Washington state's new court filing said. It said the federal government can't enforce the new travel ban unless it asks Judge Robart to modify his original restraining order. "Until they do so, they cannot escape the injunction and continue their illegal conduct," the filing said. White House spokesman Sean Spicer said last week that the administration believes the revised travel ban will stand up to legal scrutiny. Associated Press writers Christopher Weber in Los Angeles and Mark Thiessen in Anchorage, Alaska, contributed to this report.